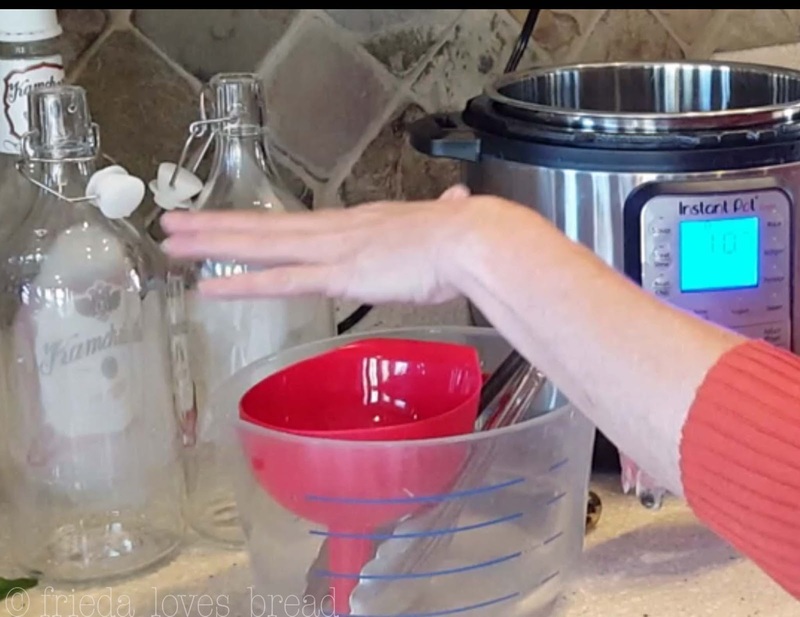 Frieda Loves Bread: Instant Pot One Pot Pressure Cooker Vanilla Extract! 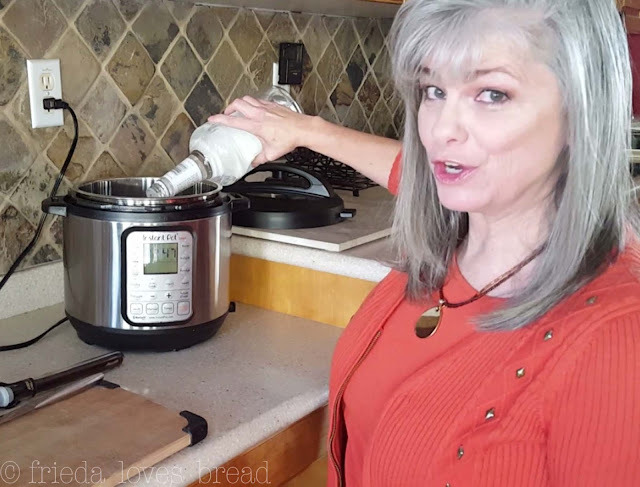 0 Instant Pot One Pot Pressure Cooker Vanilla Extract! Make your own vanilla extract in your Instant Pot or electric pressure cooker and have it ready to use in days, not months! Two simple ingredients and the magic of pressure cooking come together to make pure vanilla extract that is ready to use or gift to family and friends. You will be amazed at how simple this is and how great it will taste in your recipes! This is me, making vanilla extract, in the pressure cooker! I go through 16 ounces of Pure Vanilla extract every month making Greek Yogurt in my pressure cooker and baking Soft Sugar Cookies for friends and neighbors. Recently, the price of pure vanilla extract has more than TRIPLED! My good friend and neighbor, Jennifer, has been making homemade vanilla extract for over 20 years and her recent FaceBook post about making vanilla extract DIRECTLY in her electric pressure cooker got me interested. No jars, no trivet, no fuss, no muss. One of the BIG reasons why we, myself included, don't try new things is that we are afraid of FAILURE. That inner voice is loud and clear. "What if it doesn't turn out? Will I be able to fix it? Augghhhh! I hate wasting expensive ingredients!" 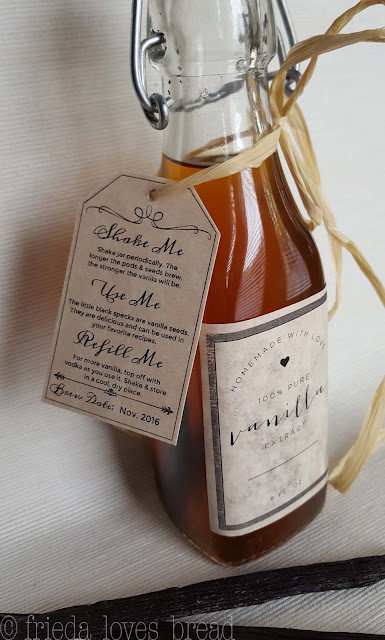 Visit this post to see a collection of beautifully decorated bottles of pressure cooker vanilla extract, using this recipe! This post contains an original recipe and method for making pure vanilla extract using an electric pressure cooker, created by my good friend, Jennifer, who has been making vanilla extract for over 20 years. This method of making FAST vanilla extract has been tested and is safe to use when the recipe, method and storage recommendations are followed. 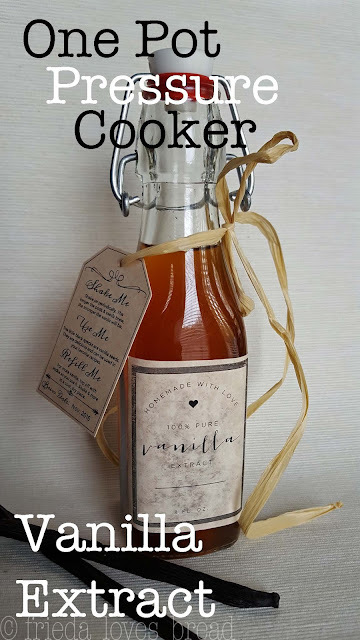 I have tested my vanilla extract, have consulted with vanilla experts, and have done a cost analysis, so if you have any concerns or questions, please take a look at this post for more information! 1. Cheaper to make. Yes, pure vanilla extract IS expensive. But.... if you make it yourself, you can reduce the cost of making vanilla substantially! Electric pressure cooker vanilla uses FEWER beans, saving you money. 2. Pick your own ingredients. When making your own vanilla extract, you know what goes in it...no extractives, no added sugars, flavors or extra water. You get to play around with different vanilla beans, liquors and create your own special blend of vanilla extract. 3. Time. Making vanilla extract with the traditional method can take months. 6-8 months, even up to a year, as vanilla becomes stronger and more flavorful as it ages. Making it in your pressure cooker gives you awesome vanilla in two weeks or less! Why does the cold extract method take so long? It takes that long for the alcohol to extract all the essence from the vanilla bean. Plus, you gotta shake it every week. (I don't know why ~ maybe to extract the seeds?) I don't have the time, energy or memory to do that kind of babysitting. 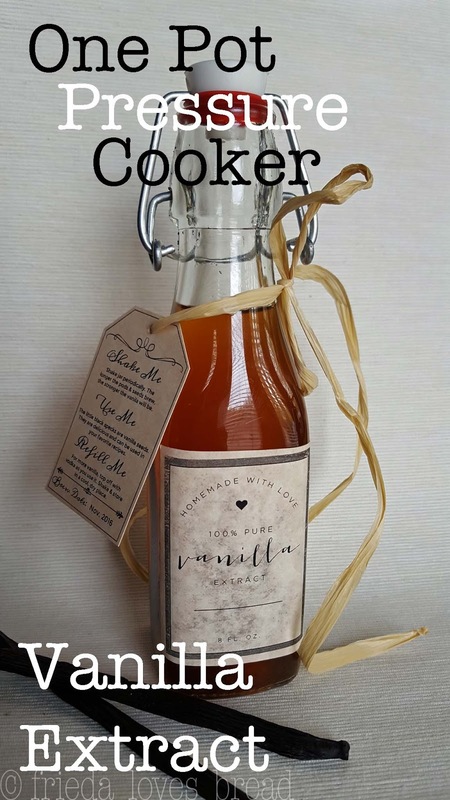 Cook's Illustrated first published the idea of making a 'hot' processed vanilla extract in 2009. Using a 'hot vodka' soak process uses fewer beans. Using an electric pressure cooker speeds up the maturation of your vanilla, allowing you to use your vanilla extract almost right away, within weeks, not months. So, if you are like me, set it and forget it, no fuss, no muss, no shaking, gotta have it now kind of person, this recipe is for YOU. 1. Choose your liquor. Why is alcohol used? It is a great extractor and natural preservative. I don't drink, and have NO clue which liquor to choose. Vodka is a good choice because it has a neutral flavor and the clean taste of vanilla comes through. Rum, bourbon and brandy, have strong flavors can make a unique vanilla extract. Proof? Look for at least 80 proof, which is 40% alcohol. The rest is distilled water. My neighbor has made vanilla extract with expensive vodka and cheap vodka and when it has aged, she has not noticed any distinguishable differences between the two. So ~ get the cheap stuff. I found a 1.75 liter of vodka for $12.28. 2. Pick your beans. Vanilla beans are graded, A & B. Grade A beans are oily, moist, and are great split, seeds scraped out and put into your favorite recipes. They last up to a year. Grade B beans are also called "extract beans." They are drier than grade A, have the same flavor as grade A, but will give you more bean for your buck as it is theorized that the plumper Grade A beans add moisture to your extract, therefore potentially weakening your extract. Pick your beans carefully. 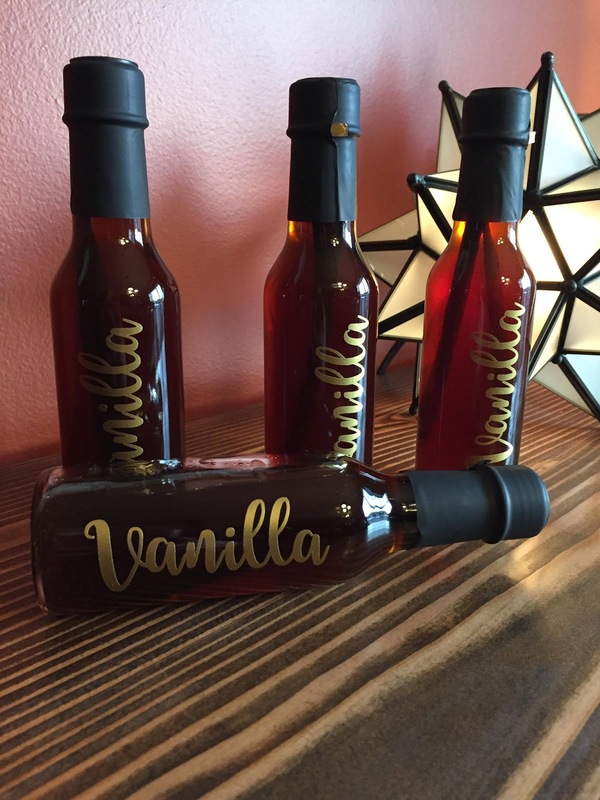 Since the price of beans have gone up, there is potential for beans to be a lower quality, which can affect the outcome of your vanilla extract. Purchase your beans from a reputable source and check the reviews for quality assurance. If the price is too good to be true, that raises a red flag for me. I wanted to try this recipe right away and Costco had vanilla beans, so I grabbed them. Next time, I want to experiment with Grade B vanilla beans. What kind of beans? Depends on what flavor you want. You can make your own blend. How many beans? Cook's Illustrated recommends 1 bean per 3/4 cup vodka. This is in stark contrast to the traditional 'cold' method of an average of 6 beans per cup. I had a 1.75 liter bottle of vodka (7.4 cups) and chose to use 10 beans. Of course, you can add more beans, but you will be also adding to the total cost to make your vanilla. I vanilla beans that are 6"-8" in length. If you use smaller/shorter beans, you may want to increase the number of beans used. Where can I find the Lowest prices? I put together a list of affordable vanilla bean prices. 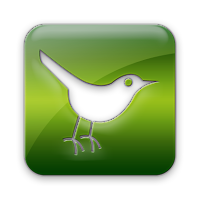 They may change in price as the holidays (Nov-Dec) approach, so get them early. How do I store my vanilla beans? Vanilla beans should be stored in a closed container, in a cool, dry, dark place. Do not put them in the fridge or freezer. The cold air will dry the beans out and may promote a type of vanilla mold. Vacuum packing vanilla beans are not recommended, as they can develop an unpleasant, acrid smell. Costco carries Rodelle Vanilla beans in 2 glass tubes; 10 beans total, which are Grade A beans. I paid $16.74, which brings my cost so far to $29.02 (tax included). I started to sweat. That's expensive for an experiment..... The inner voices of fear started to creep in, but I closed my eyes and dove right in. At least you will learn from my mistakes, right? This is an experiment, right? It's only 2 ingredients ~ what could go wrong? 3. Pour the vodka into the electric pressure cooker liner. All of it. No sampling! 4. Split & Scrape your beans. Starting about 1" from the top, insert a sharp paring knife in the middle through the top layer only, and work your way down, cut the bean to the end tip. Next time, I plan on scraping out my seeds (using the dull edge of the knife or a spoon) and put swirling them into the vodka already in the pressure cooker liner. Doing this will help darken, flavor the vanilla extract and mature it much more quickly. This will also make your vanilla extract cloudy. You can strain your extract through a coffee filter for a more clear vanilla, if desired. 5. Put the split and scraped beans into the vodka. If you are using bottles that are shorter than your beans, cut them to fit; in halves or thirds. 6. Set your electric pressure cooker. Make sure your seal is seated correctly and firmly. This is important! You do not want to forget to close/seal your valve and let all your liquid escape! *Make sure your electric pressure cooker is not near any open flame: gas stovetop, candle, etc. There will be some alcohol/water vapor that comes through the pressure valve during the first few moments of coming up to pressure. Set it for high pressure (manual) and the time to 60 minutes. It took my Instant Pot about 10 minutes to come to pressure and begin counting down. After the 60 minutes, you want the pressure to release naturally. 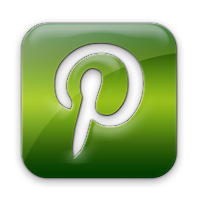 Don't do anything until the pin drops down all by itself. This will take almost an hour. I kept peeking, checking, wondering if something was wrong, and it took all of my willpower to not jiggle the lid or push the pin down! 7. Sterilize your equipment. Bottles, funnel, large measuring cup with a pour spout, rubber spatula and tongs were what I used. Clean everything with hot, soapy water, rinse well, and pour boiling water over everything. This is important to ensure shelf stability of your vanilla extract. 8. When pressure is FULLY & naturally released, open your pressure cooker. You made vanilla! Do a happy dance! 9. Remove beans from pressure cooker. 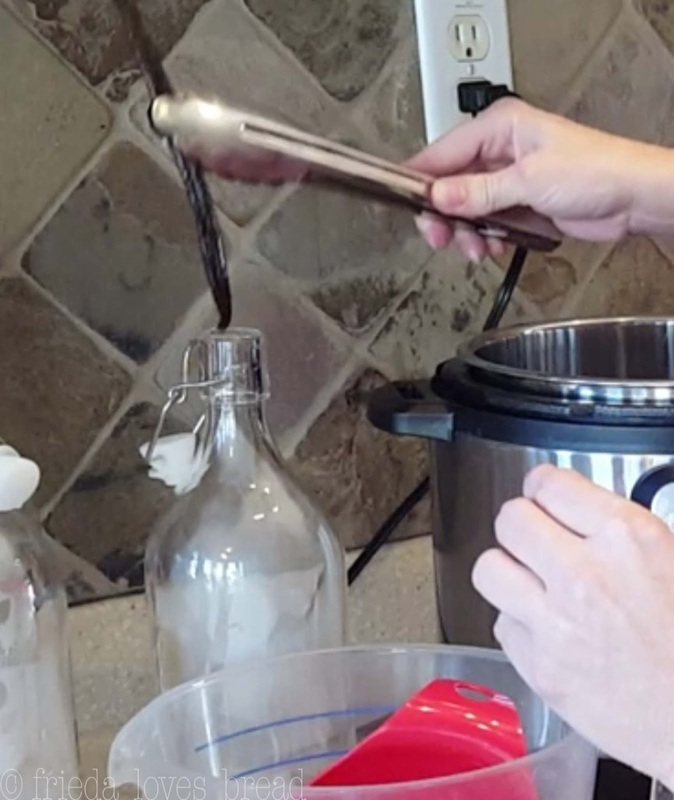 Use sterilized tongs to remove beans and place them into your sterilized bottles. 10. 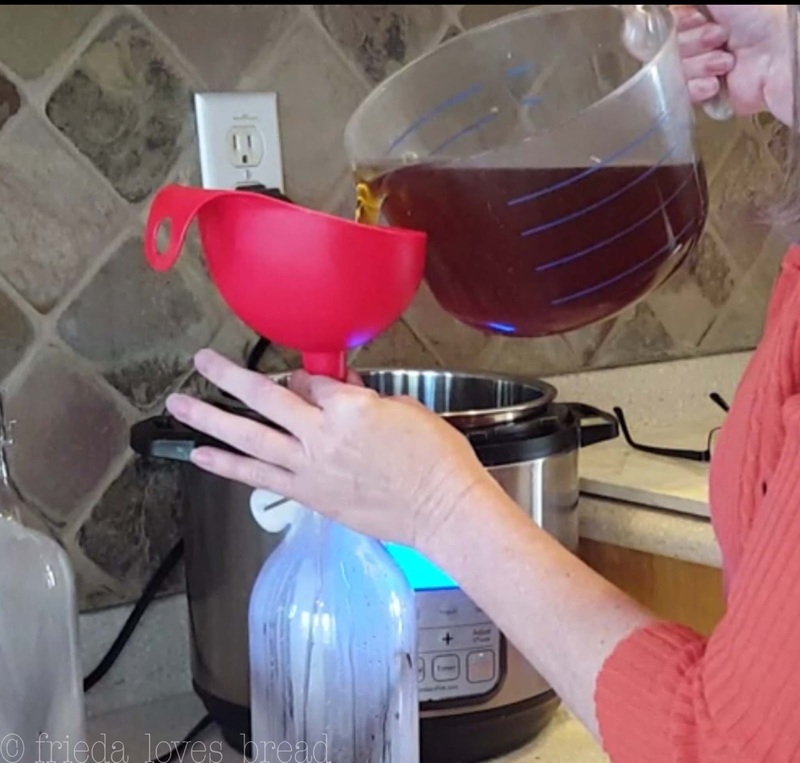 Pour your extract into a large measuring cup with a spout. Swish the pot and try to get as many of the bajillion seeds out that you can. If necessary, use a rubber spatula to get the rest of the seeds out. 11. Put a funnel on your bottle and fill with vanilla extract. Make sure your funnel fits. Mine was a tight fit and I needed to hold it to make sure it wouldn't topple over and spill my precious vanilla! I'm so excited to use my vanilla! The vanilla is ready to use, but it will become more mellow and stronger as it 'ages.' Save yourself some money, some time, and enjoy using homemade vanilla extract in all your recipes! Keep it in a dark, cool, place ~ shake it, smell it, love it, and kiss it whenever you see it. In a week or so, it will be amazing. **You can make this vanilla for a lot less by pricing out your beans, buying them in bulk and finding great deals on bottles at your Dollar store. **This recipe has been tested for up to 3.5 liters of vodka total in a 6 qt electric pressure cooker. **If you are using a 3 quart pressure cooker, use only 4 cups total volume of alcohol. Do not try to use more than this amount in a 3 quart Mini. 10 Vanilla Beans (6"-8" long - If your beans are shorter, increase the number of beans to 15-20. 1.75 liter bottle of Vodka - get the cheap stuff, at least 80 proof. Rum, brandy, or Bourbon can be used. Electric Pressure cooker - Do NOT use a stove top pressure cooker! 1. Pour the entire contents of vodka directly into the pressure cooker liner. 2. Using a sharp knife, starting 1" from one end, cut through the TOP layer of the bean and continue lengthwise all the way down to the end. 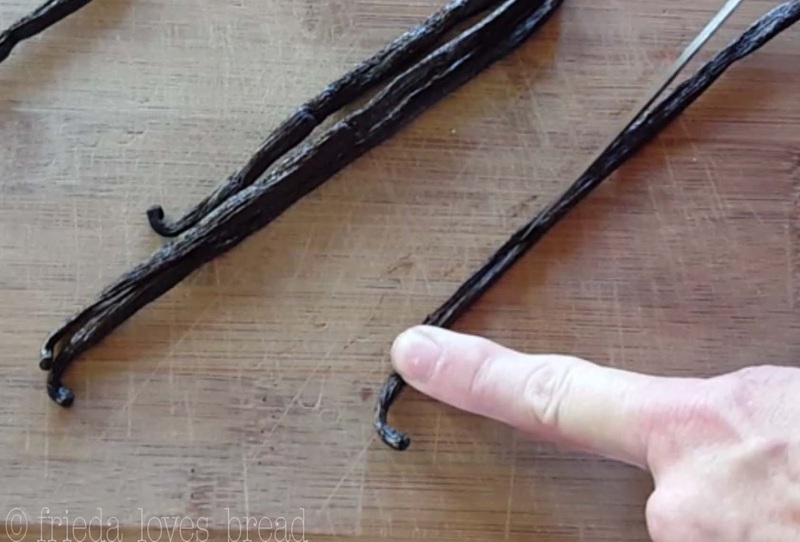 *Open the split vanilla bean, using the dull edge of your knife or a spoon, scrape out the vanilla seeds and swish the knife/spoon in the vodka to clean the seeds off. Repeat with the rest of the beans. If using bottles that are shorter than your beans, cut them to fit. (in half or in thirds) *Scraping the vanilla bean is optional. 3. Put the prepared beans into the pressure cooker filled with vodka. 5. Select High Pressure or manual. 6. Set the timer for 60 minutes. 7. Let the cooker come to pressure, about 10 min, and let it naturally release, about an hour. Do NOT use a Quick Release. If your pressure cooker has a Keep Warm feature, turn it off or unplug the cooker. 8. Sterilize your bottles, measuring cup, tongs, spatula and funnel by washing in hot, soapy water, rinsing well and then covering all equipment with hot, boiling water. 9. When all the pressure has naturally released and the pin has dropped, open your pressure cooker. 10. Using tongs, remove the beans, divide them between your bottles and place them inside. 11. Pour the vanilla extract into the large glass measuring cup. Swish the pot liner to gather as many of the seeds as you can. Use a silicone spatula to get the rest of the seeds, if necessary. 12. Put the funnel on your bottle. Carefully pour the vanilla into your bottle, and note how full you are filling it while doing so. 13. Cool for 15 minutes, loosely capped and then fully cap your bottles. When extract has cooled, clean and dry your bottles before placing labels. Store your vanilla in a cool, dark place away from sunlight, tightly closed/capped. Do not put in the refrigerator or freezer. Your vanilla will be ready to use in a week or two. Over time, it will mellow out, become darker, and stronger as it ages and matures. Shelf life: Indefinite, as long as it is stored properly in a cool, dark place away from sunlight and the beans are always submerged in the alcohol. Do not freeze or store in the fridge. What can I do with the left over beans? Leave it in the bottle and top it with more vodka when it's half full or starts to lose flavor. 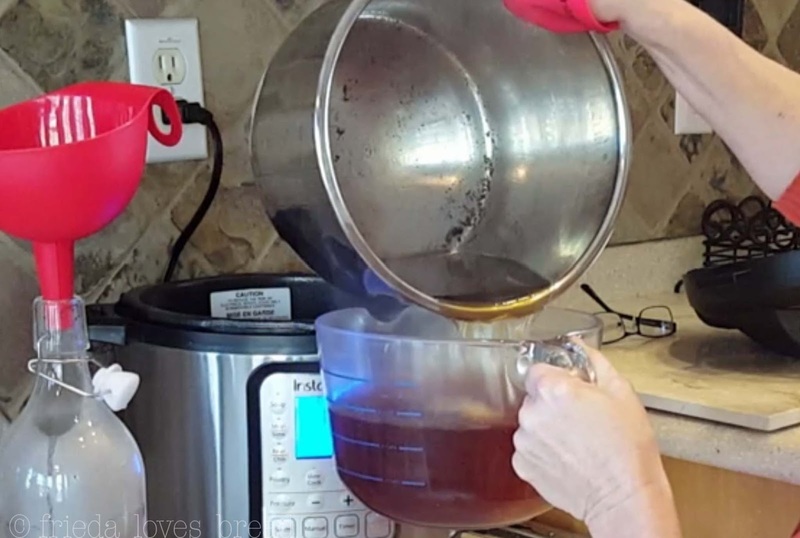 I'm not sure if you will get more extract since the pressure cooker seems to have 'pulled' quite a bit, but with the cold extraction, you get more vanilla, extending the usability of your beans. Make sure your beans are covered. Take 6 vanilla beans, let air dry for about 2 days. Break them up and put them into a food processor till finely ground. Add 1/2 cup agave nectar or a simple syrup and pulse. Pour through a fine strainer to remove pulp. This is my favorite way to 'recycle' my beans. Let the pods dry for a day or two, then put into your container of granulated sugar. So fun to open and smell the vanilla! The vanilla sugar will enhance whatever you use it for. Bring equal parts granulated sugar and water to a boil; add the used bean pods, and simmer till the sugar is dissolved. Store the syrup in the fridge and use in in iced tea or coffee. 1 teaspoon = one sugar cube. Can I reuse the beans? It depends on how long they have been extracting, alcohol concentration, size of the bean, etc. If you reuse them for making extract, you may need to add new beans as well.